We’re more than halfway done with our western road trip and I can’t believe how much fun we’ve packed in so far. We are leaving Jackson Hole after an amazing weekend with some of our best friends and heading to Cheyenne to see James’ old stomping grounds. One of the highlights of the trip so far has been spending four days exploring the country’s first national park, Yellowstone. 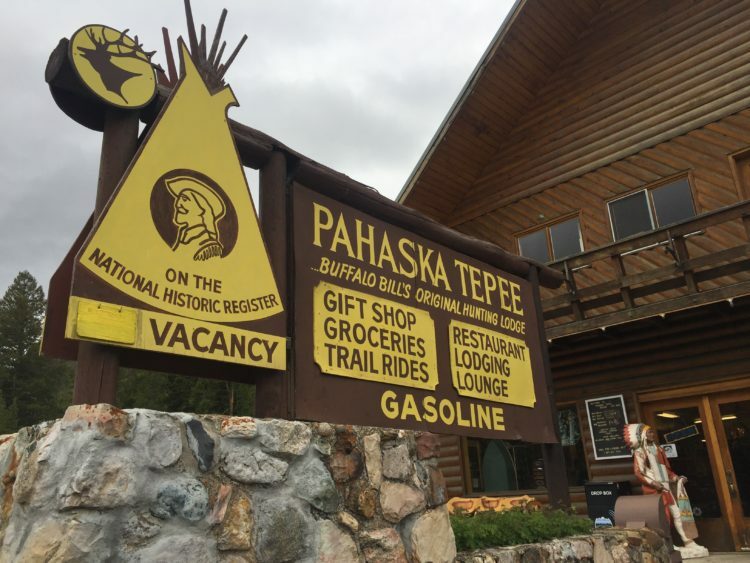 We opted to stay right outside of the park at Pahaska Tepee Resort, which Buffalo Bill started to help encourage tourism in Cody, Wyoming. The cabins are small and rustic, but comfortable and clean. There’s also a restaurant, tavern, gas station and gift shop on site. We were only about two miles outside of the west gate, which was perfect. We decided we wanted to hit all of the major highlights at Yellowstone since it was my first time there, as well as get some good hikes in. We packed some pretty full days in the park to make the most of our time, starting with a visit to the park the night we arrived. We drove in through the west gate, stopping at turnouts along the way to take in beautiful views of the lake and mountains. We saw a grizzly bear along the side of the road, as well as plenty of mountain rams and bison. We left the park as the sun was setting to rest up for our first full day in the park. We started the day early with a trip to Old Faithful. We made it there before 9 a.m., which meant we beat the big crowds. After watching the geyser erupt from the viewing platform, we hiked up to the Old Faithful overlook, which was a short but steep trek. We made it up just in time to see Old Faithful give us another show. We then hiked down and walked all the way around the upper geyser basin, which is full of amazing thermal features. I checked my Fitbit when we left around noon and we’d already walked more than 20,000 steps! Our next stop was a short drive away: Midway Geyser Basin. This was my favorite part of the park. 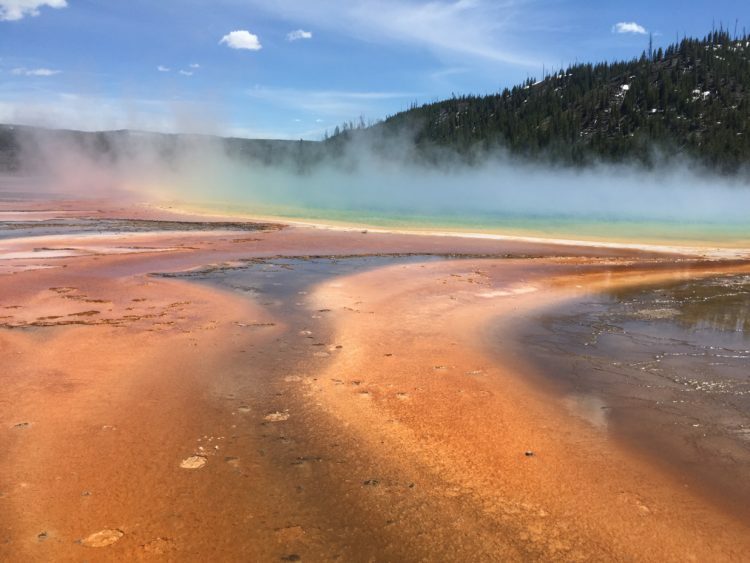 It’s where you’ll find the rainbow-like Grand Prismatic spring. It was amazing to see the colored steam blowing off the thermal waters. It often felt like we were on another planet while exploring different areas of the park. We capped the day off with a visit to the beautiful artist’s point for an amazing view of the lower canyon falls. The road from Canyon Village to Tower Falls was unexpectedly closed because of a water main break, so we headed back toward Lake Yellowstone, stopping to hike around the West Thumb thermal features on our way. We had reservations for dinner at the Lake Yellowstone Hotel, which James called one month ahead of time to secure. You’re definitely paying for the view at the restaurant – the food wasn’t very good. I would skip the pricey dinner and instead enjoy cocktails at one of the tables facing the lake in the lobby. Day two at Yellowstone was another packed one. Because of road construction, we had to take the scenic route to make our way to the northern part of the park. We drove a couple of hours before making it to the Norris Geyser Basin, which boasts the world’s tallest geyser. 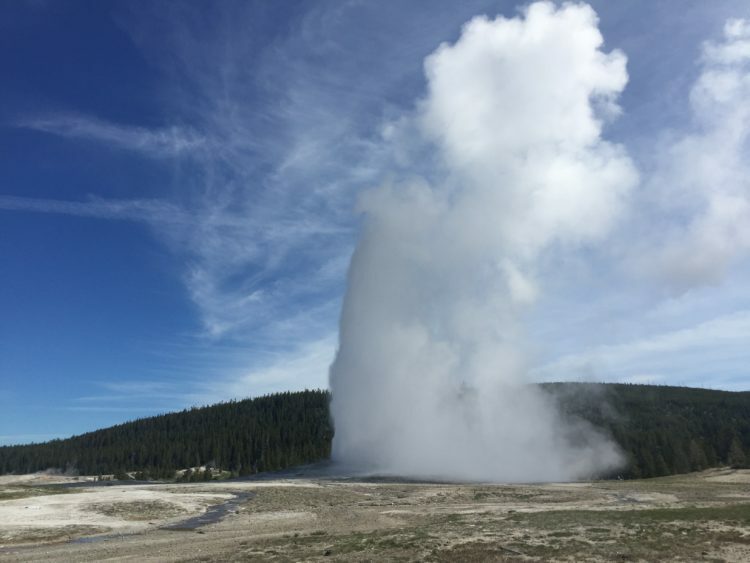 Unfortunately, the Steamboat Geyser doesn’t erupt as regularly as it once did and hasn’t fully erupted since 2014. We hiked around the upper and lower loops, which take you around several thermal features. 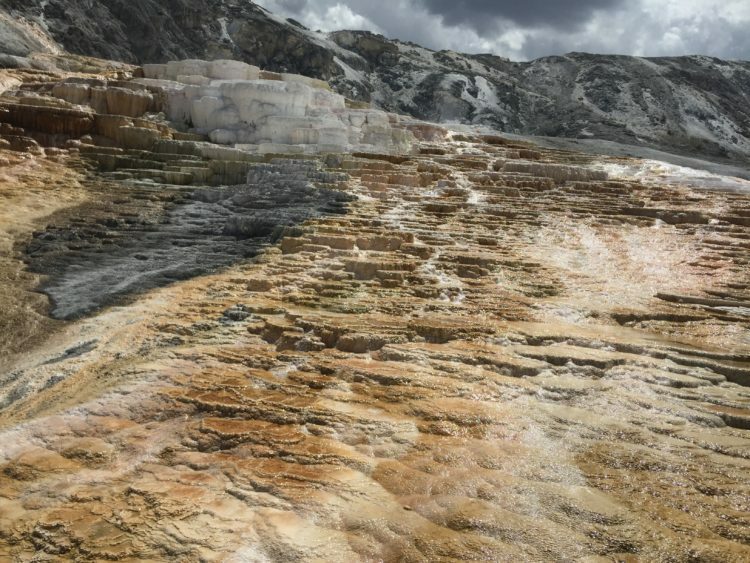 Next up was a short drive to Mammoth Springs, which was unlike anything else we saw in the park. The thermal features turned the stone a variety of odd colors, which sparkled as the water trickled down. We hiked up to the overlook of the springs, which look especially odd when you see the lush hills and mountains as their backdrop. 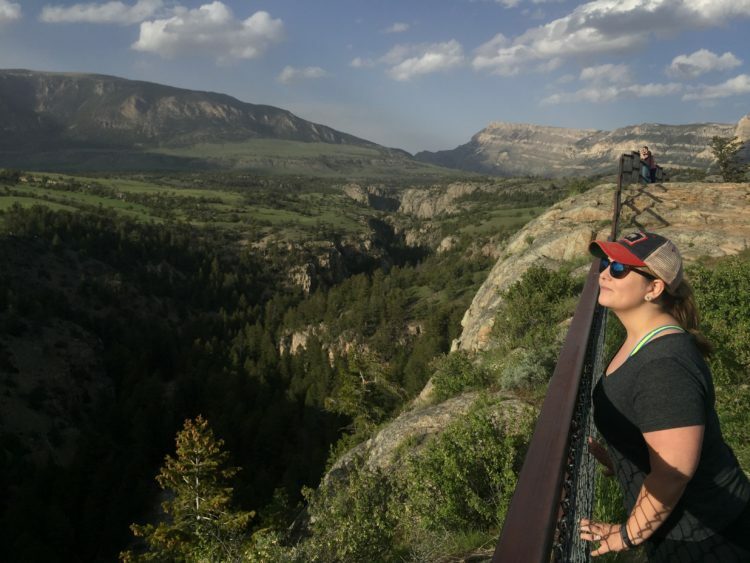 We hopped back in the car and drove to Tower Fall, where we saw another amazing view, before driving through the Lamar Valley, which is famous for wildlife viewing. We stopped at several points along the road and saw lines of photographers setup with tripods, waiting patiently to spot a pack of wolves or herd of bison. James says this was his favorite part of the park because the valley was so different from the rest of Yellowstone. Because of all the road closures, we decided to leave through the northeast gate and head toward Cody for dinner. I’m so glad we took the detour, because it’s been the most beautiful drive of the trip so far. We drove over the appropriately-named Sunlight Bridge and pulled over to take in the amazing views of the mountain. We did the same thing when we got to the top of Dead Indian Pass. If I’ve learned anything on my first road trip, it’s to always stop and soak in the wonders of nature. It’s worth every second of extra time you have to spend in the car later. We grabbed dinner at Pat O’Hara’s Brewery in Cody, which hit the spot after a long day in the car. We went to bed before 10 p.m. almost every night because we were so worn out. The weather on our last day near Yellowstone wasn’t great, so we only spent half the day in the park. We decided to hike around some of the thermal features and trails we passed in between the Fishing Bridge and Canyon Village, including Mud Volcano. 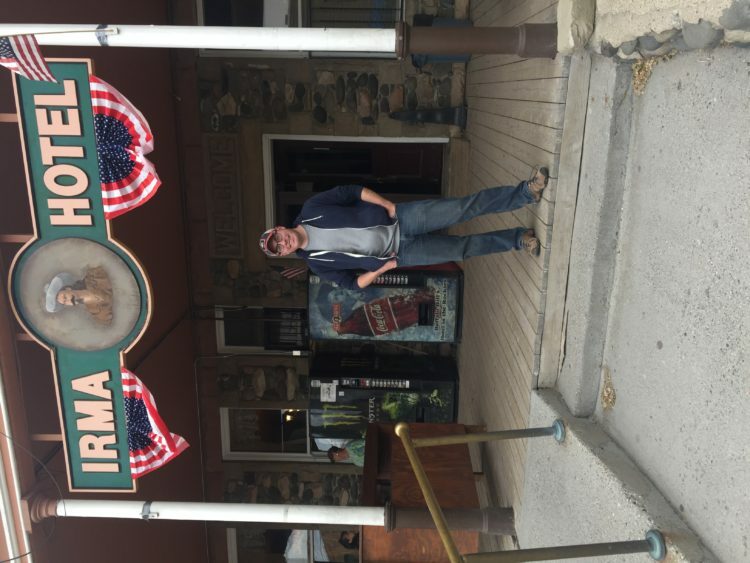 As the temperature continued to drop and it started to rain, we headed back into Cody to check out the Buffalo Bill Center of the West. One of the seasonal workers at our hotel recommended visiting the museum, which blew us away. I knew very little about Buffalo Bill Cody and learned so much about his life and his contributions to the west. The museum is split up into several sections, including Western art, natural history, plains Indians and guns. We only went through about 1/3 of the museum in the couple of hours we were there. 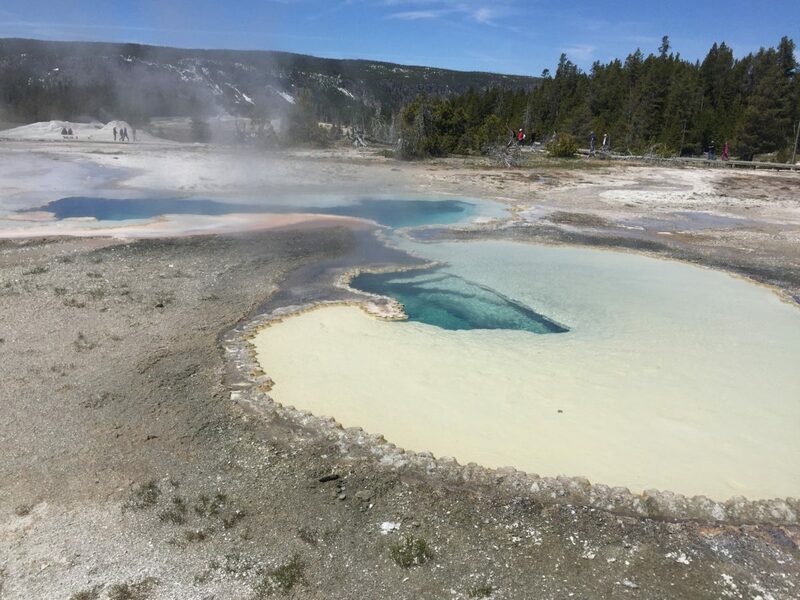 The natural history portion was especially interesting because it focused on the wildlife in Yellowstone and the challenges the park faces when it comes to balancing the wild with public access to the park. We finished the day with a stop at Buffalo Bill’s Irma Hotel downtown and dinner at Millstone Pizza and Brewery. I know we barely scratched the surface of what Yellowstone has to offer, so we are already planning on making a return trip. Since we’ve hit the highlights of the park, I want to get a backcountry permit during our next visit. There’s something therapeutic about getting back to nature and it’s just what we needed. I definitely have some tips for planning a trip to Yellowstone after doing so ourselves. I plan to put together a separate post with all of that info in the next week. But, for now, it’s on to Cheyenne!